606 pages | 282 B/W Illus. To achieve environmental sustainability in industrial plants, resource conservation activities such as material recovery have begun incorporating process integration techniques for reusing and recycling water, utility gases, solvents, and solid waste. Process Integration for Resource Conservation presents state-of-the-art, cost-effective techniques, including pinch analysis and mathematical optimization, for numerous conservation problems. Following the holistic philosophy of process integration, the author emphasizes the goal of setting performance targets ahead of detailed design. He explains various industrial examples step by step and offers demo software and other materials online. Ideal for students preparing for real-world work as well as industrial practitioners, the text provides a systematic guide to the latest process integration techniques for performing material recovery in process plants. In this book, Dr. Foo manages to elegantly transform the theories and concepts into effective educational tools, exciting reading materials, and very useful applications. … Overall, this is an excellent contribution that will benefit numerous researchers, students, and process engineers and will serve the cause of sustainability worldwide. The main contribution of this textbook is that it brings together a family of systematic design tools that can be used to determine the most cost-effective measures to implement recycle and reuse of process streams in industrial plants. … suitable for a wide range of audiences, from advanced undergraduate students to practicing engineers from the process industries. … this excellent book comes at just the right time to teach the next generation of process designers how to ‘save the planet’ more systematically and intelligently. 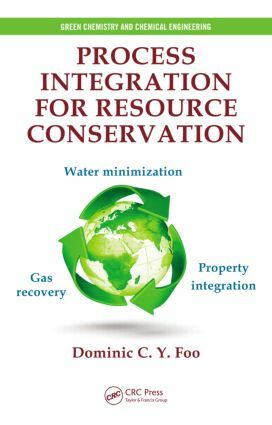 This book collects all fundamentals aspects of process integration to enable readers to address issues related to resource management. I strongly recommend this book to everyone interested in the field of process integration." This book serves as good material for process integration … it [also] offers good knowledge of material recovery that helps people [acquire the] basics for doing further research or practical application. The chapters are written very well and cover all the topics in sufficient detail and clarity. … a wonderful and relevant contribution to the field of process integration. Problems and References appear at the end of each chapter.